A new study reveals that commonly-used anti-inflammatories may raise patient risk of heart attacks if taken while having a cold or flu. The study is based on data from over 10, 000 patients in Taiwan from 2005 to 2011 with an average age over 73 and who were hospitalized because of a heart attack. This data supports previous studies which showed an increased risk for heart attacks during a respiratory infection, such as cold or influenza, as well as with use of certain anti-inflammatory pain relievers. However, the interaction between the infections and class of painkillers was not examined. The use of non-steroidal anti-inflammatories or NSAIDS during a respiratory infection was associated with a three-fold increased risk of heart attack, noted Yao-Chun from the National Taiwan University Hospital in Taipei in the Journal of Infectious Diseases. The risk for heart attack was higher when NSAIDS were delivered via intravenous injections at the hospital. Rather than relying on pain killers such Aspirin, naproxen, and ibuprofen, doctors recommend taking acetaminophen instead. But, patients with intense pain, such as those with arthritis, may require anti-inflammatories, which is usually okay, except if the patient is suffering from pneumonia or a really bad chest infection. Nevertheless, the main issue with this and similar studies is that direct cause and effect cannot be determined. IT is impossible to know for certain if the cause of the heart attack is a result of the anti-inflammatory or another underlying reason. NSAIDs contain salts that may result in heart attacks by raising blood pressure that causes patients to retain extra fluid. In 2015, the U.S. Food and Drug Administration elevated its warning labels on over-the-counter NSAIDs to highlight elevated risks for heart attack and stroke. 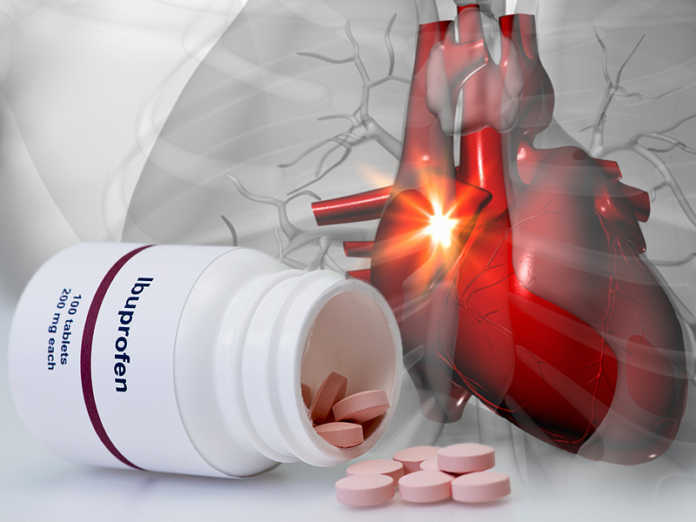 Further research is required to study the correlation between NSAIDS and various infections in relation to heart attack risks. Dr. Jacob Udell, a cardiologist and scientist at Women’s College Hospital and Toronto General Hospital started a randomized clinical trial to test if giving flu shots prevents heart and lung problems and deaths. Results are expected in 2020. Next articlePopRx: Improving Pharmacy-Patient Interaction or Dumbing-Down the Role of Pharmacists?